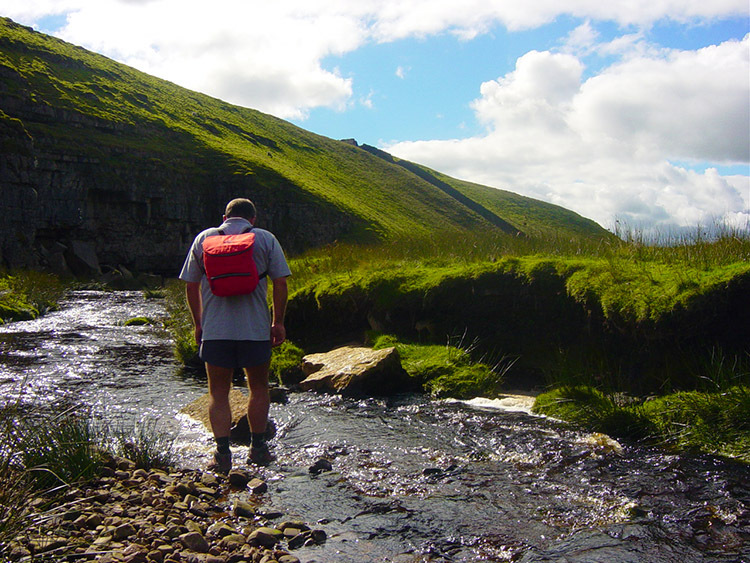 Summary: The walk visits two of the unsung highlights of the Wharfedale area. 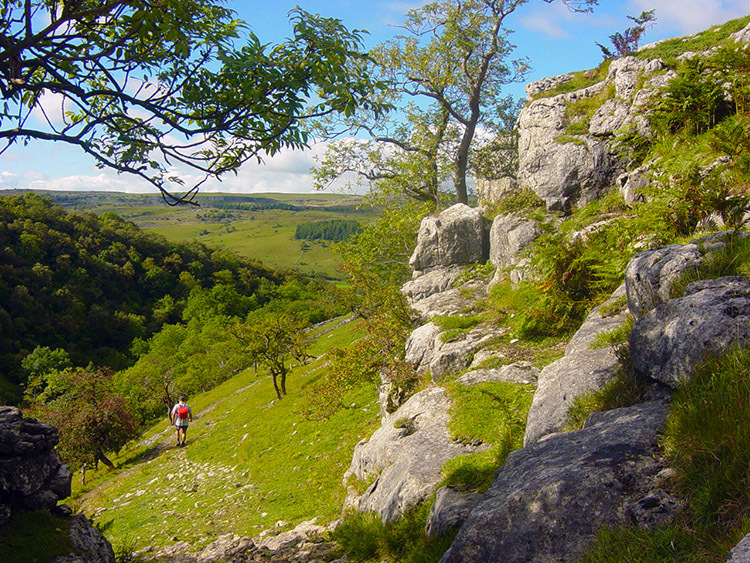 Conistone Dib is an exciting climb through a dry valley which includes a super narrow section between two limestone pillars. 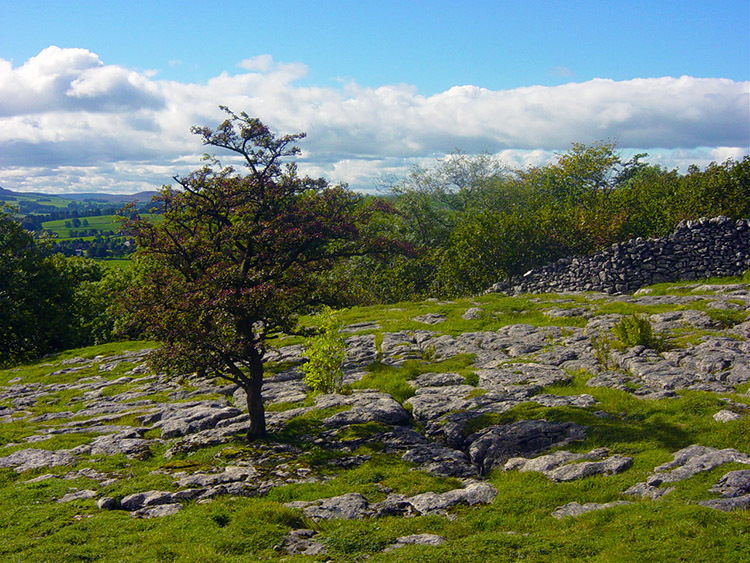 It ends with a short scramble onto the limestone pavement between Grassington and Kettlewell. After Conistone Dib the walk continues over more limestone to Bycliffe, then on to Mossdale Scar. The scar is notable for here Mossdale Beck disappears, never to be seen above ground again. It is fascinating watching the waters of the beck disappear through rocky cracks in the scar. The walk concludes with a moorland walk back to Grassington. 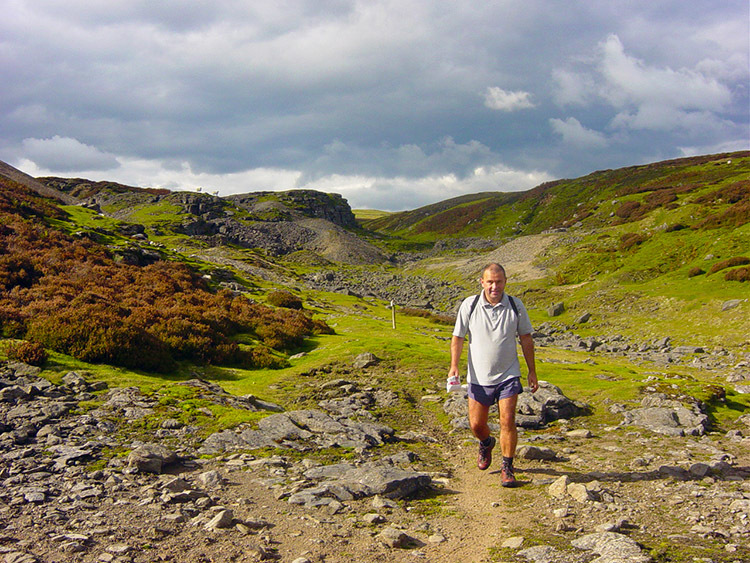 Joe and I took advantage of a lovely late September day to enjoy a lovely walk in the Grassington area. Joe is a recent convert to country walking and just like me about 12 years ago he now can't seem to get enough. 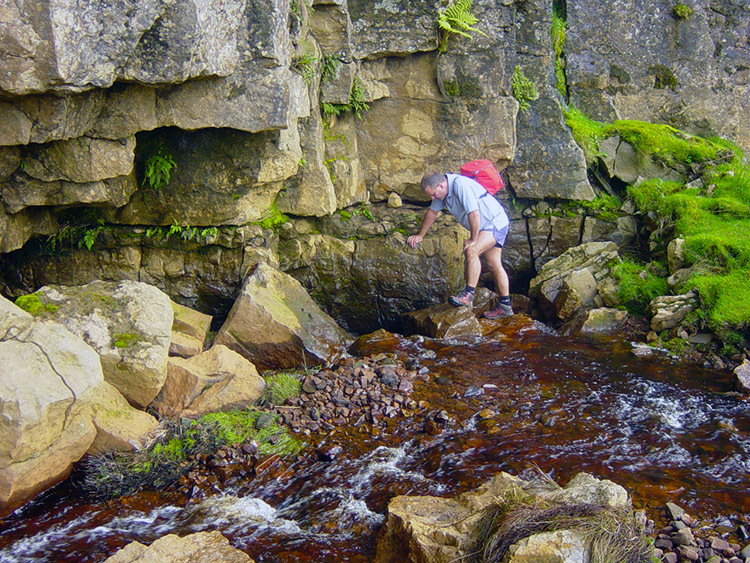 I planned this walk to introduce him to some of the superb characteristics of the Yorkshire Dales for he was going to walk over spectacular limestone pavements before taking a walk through a short narrow gorge. Then he would complete a short easy scramble on Conistone Dib. After the excitement of the scramble I planned to take him to Mossdale Scar where the substantial Mossdale Beck disappears underground. As we drove over from Leeds to Grassington it rained. But the forecast was good with promise of a clearing sky after the early morning gloom and for once the forecasters were right. The rain had stopped and the sun was out when we parked up in Grassington. We were in good spirits to complement the improving weather as we set off out of Grassington following the Dales Way onto the limestone pavement at Cove Scar. The emerging blue sky with bubbly white clouds added visual impact to the excellent panoramic views we had. In late September the heat haze is no longer compromises the visibility and we enjoyed crystal clear views of he surrounding countryside. The Cracoe Monument on Embsay Moor stood out vividly as we looked to the south. Ahead of us the limestone scars were brilliant white making them a mesmerising draw on the eyes. I scanned the features of them as we walked to the edge of Bastow Wood. After walking alongside Bastow Wood we crossed over a wall via a stile and then gingerly stepped down a steep banking. Two walkers ahead of us declined the steep challenge and found a second path skirting round the descent at a gentler angle. Before the descent they were ahead of us. After the descent they were behind. Joe and I enjoyed this excellent section of walking as we lost height following the path into Conistone. 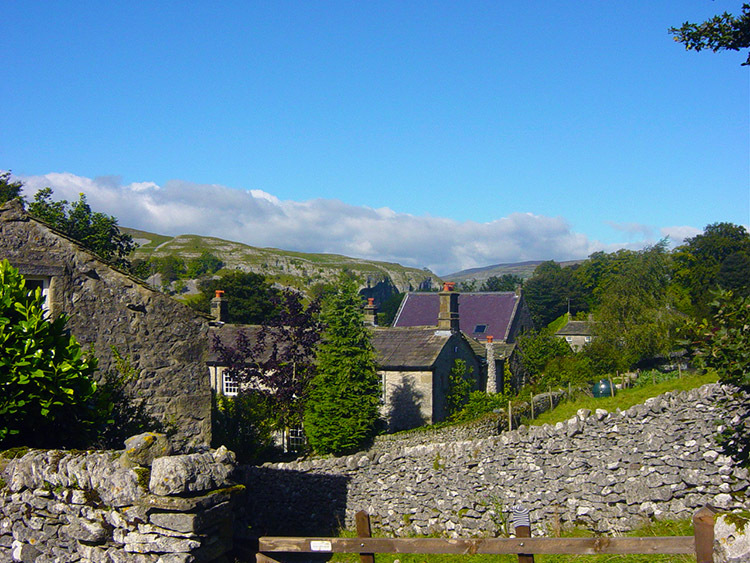 We had a drinks break in the square of this delightful peaceful dales village and then set off on out walk up Conistone Dib limestone gorge. As soon as the climbing starts the Dib narrows dramatically. At the narrowest point it is no more than 3 feet wide so has to be taken in single file. Soon the Dib opens up again. Joe and I enjoy a walk in total peace as we follow the Dib up to a second narrow section at its conclusion. The final few steps back onto the limestone pavements we had earlier left at Bastow Wood include a short scramble. We both enjoyed the scramble but both of us were a little puffed at the top and took a short standing break until we had caught our breath. Then we crossed over the course of the Dales Way and followed a bridle road north east. We were now on Bycliffe Road which is part of a packhorse trail that leads from Wharfedale to Nidderdale. Once a much used road by local folk and traders it is now only used by local farmers and walkers. We followed the road towards Bycliffe. En route we came to a fork staying on the bridle road by taking the Middlesmoor sign. This would lead us to Mossdale. Up until we had taken the Bycliffe Road we had met groups of walkers taking advantage of the lovely day. 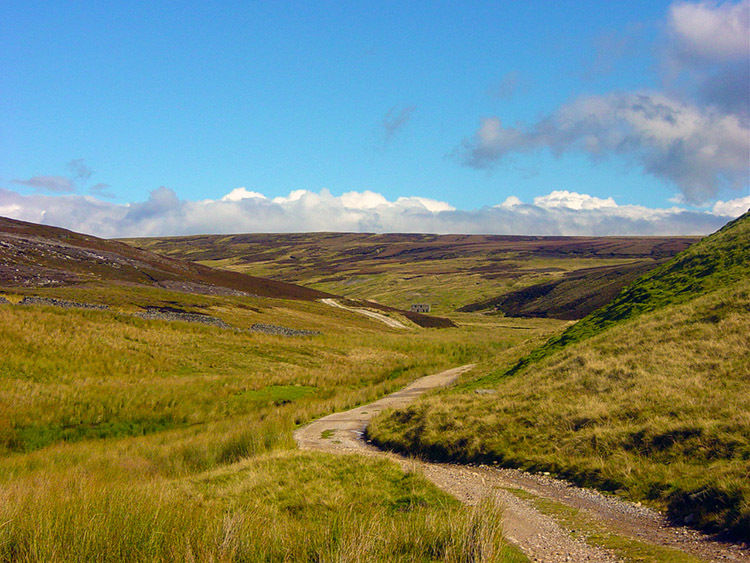 The area near the Dales Way between Grassington and Kettlewell is always popular. After joined Bycliffe Road we were to meet no more walkers. I wonder sometimes about why walkers are not more adventurous. There are always gems of interesting features to be found and I always find it fulfilling to walk in areas where few other walkers venture. Mossdale is such a place. It lies between Conistone Moor and Bycliffe. Mossdale Beck runs off Conistone Moor from its origins on Great Whernside. By the time it reaches Mossdale Scar it is a significant watercourse. Being elsewhere it would continue on an overland course to the River Wharfe and on its way enjoy a lot of company from walkers enjoying a beck side stroll. 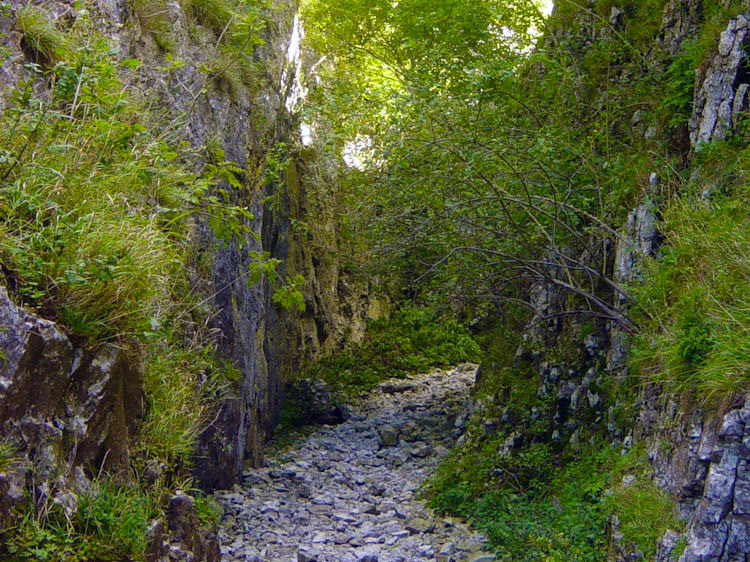 Instead it sinks from Mossdale Scar into Mossdale Caverns. 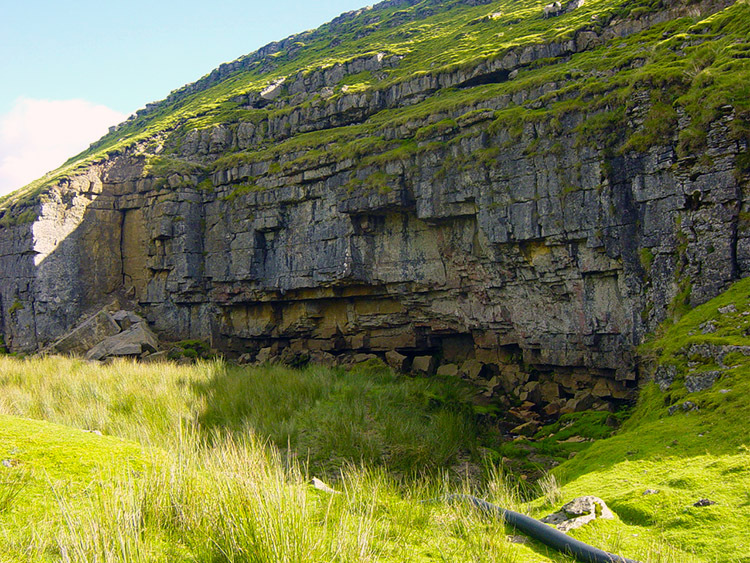 The caverns below Mossdale Scar are the location of Britain's greatest caving tragedy for in 1967 Mossdale Beck flooded the caverns causing the death of six young cavers. Thereafter Mossdale Scar became a poignant place. Despite Mossdale Scar's black day it is a place that draws me because of its splendid isolated location. 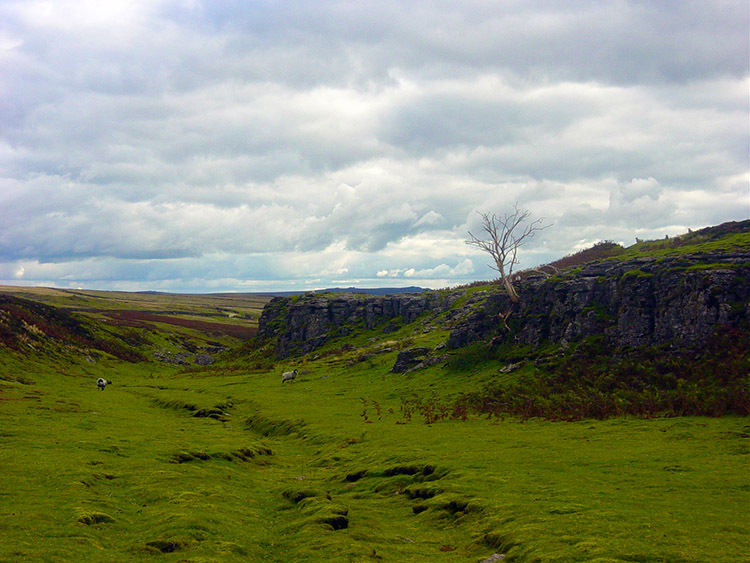 After following the bridleway for about 2 miles we arrived at Mossdale Scar. You will not see the scar until you are upon it for it is secretly hidden around a corner. While there we took time to watch the waters of Mossdale Beck tumbling into the darkness and noted how easy it would be for the beck to turn from gentle running to a raging torrent. We stayed at the Scar for lunch. We then enjoyed some super off route walking as I navigated us over limestone outcrops on Black Edge. Eventually I took a bearing to Gill House. 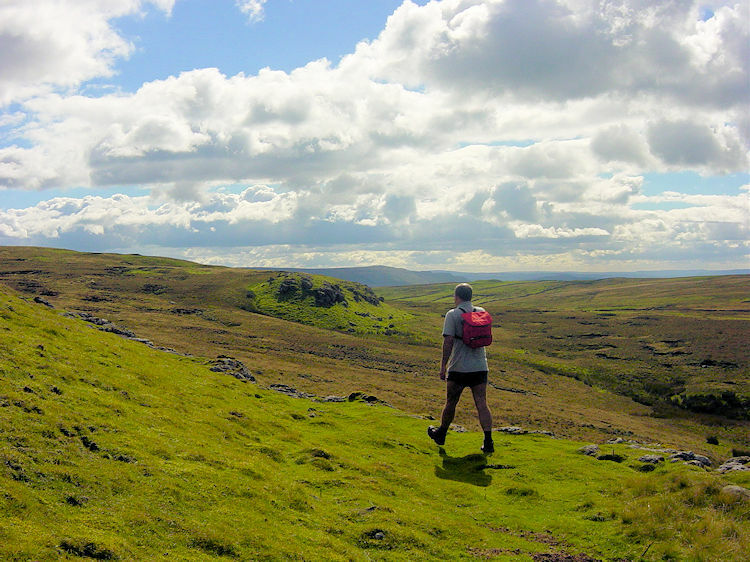 Once there we followed a lovely moorland path back to Grassington. We had enjoyed a scenic walk together, discussed a tragedy, discussed life and friends. We had a great time. Caution note: The route from Mossdale Scar to Gill House requires careful navigation. There are no distinct paths. Joe and I found it comfortable to navigate but it is easy to go wrong, especially in foggy conditions. If unsure return from Mossdale Scar retracing your steps on the Bycliff track for about 1 mile until you reach a footpath sign pointing south. This will take you (via a right fork) to Bare House and then directly back to Grassington. If you wish to follow the route we took then you may wish to follow the instructions which were kindly donated by Val Walker Jones, a fellow walker now living in North Wales who makes pilgrimages back to the Dales whenever she can. She is very familiar with the Mossdale area. 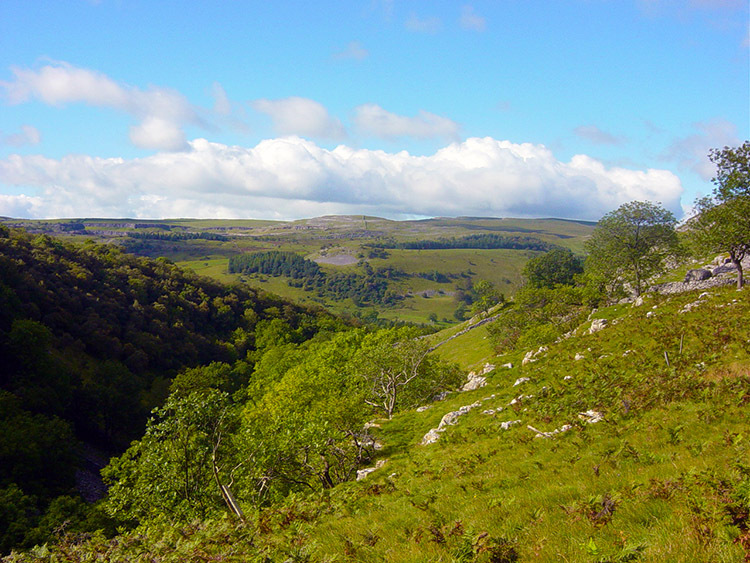 "After going up the side of Mossdale Scar, and then along Black Edge, take a bearing down to Gill House by all means, but the path is not clear. After going down from Black Edge I go to the right hand side of the wall going down to Gill House. Just before Gill House there are no gates which open, or stiles (no right of way here) and walkers have to negotiate the beck, climbing around the wall which goes straight down to the beck. Only after Gill House does one join rights of way and a clearer way back down into Grassington. Also walkers should be aware that the Dales Way has been diverted out of the farm yard and is joined further up the lane out of Grassington (probably shown on recent maps).